As soon as I saw this sketch for Mojo Monday, I knew that I wanted to try it out. It took all week, but I finally had the chance yesterday. This sweet ATS Gingersnap image colored up in no time at all and I used my brand new Nesties that I bought at Sweet'n Sassy Stamps. I love them! I used my Copic Airbrusher to create the soft background. Now that I have my craft room, I just leave the system all set up and it is ready to go. So many of you have asked to see pics of my new room and I will post some....I just want to finish setting it all up. It was a rush to get in over Christmas so I am just now placing and organizing things. I decided to make my own cushions for the window seat (after I found out how much it would cost to have them made - outrageous!) and it is taking longer than I expected. I had to cut the high density batting to fit the seat and let me tell you....it was no easy task. I didn't expect it to be so hard to do. After a couple of hours of sweating and using my kitchen bread knife (I am highly inventive when I need to be) they are cut. Of course I must have looked like a mad woman. There were little pieces of it all stuck to my head when I was done. Good thing only the 3 year old was home to see. This is just adorable Jeanette!! your little angel is very cute!! I love the way you stencilled inside your Nestie image - I am too frightened to try that yet!! What a pretty card....I love how you colored her in. 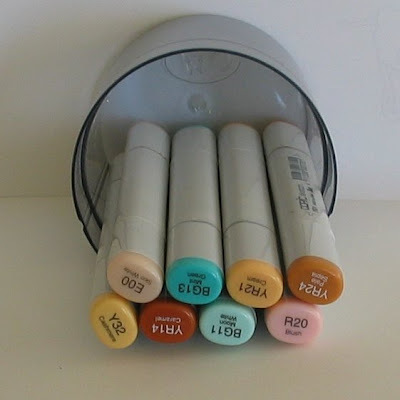 Thank you for sharing the copics you used...that is so helpful! 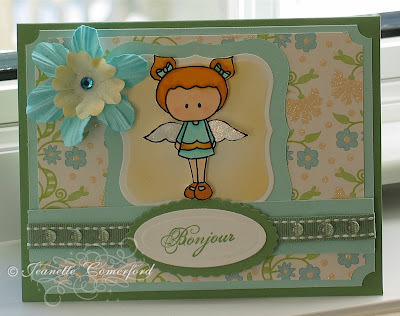 Beautiful card and colours used Jeanette. Lovely to hear about your ventures in your new craft room! This is sooo pretty, Jeanette! I love these little angels but I have resisted the temptation,lol!!! Looking forward to seeing the pics of your new room it sounds fantastic,with a window seat,how nice!!! Another sweet card, the image is adorable and the coloring excellent! Oh, the colors on this are to die for! The are so tranquil! I just love them!! Great job on the coloring as well! Thanks for showing the markers! Jeanette what a super cute card! I love it and love those stamps! SO adorable!!! I CAN'T WAIT to see pics of your room!!! :) I am so excited! very pretty and nice job with the sketch- good luck with the contest! So cute Jeanette!! She is so precious! !